Yep, you read it right....skirt, not slip. The color of the materials gives it a slip like look, but it's a basic sheer overlay skirt with a simple elastic waistband. 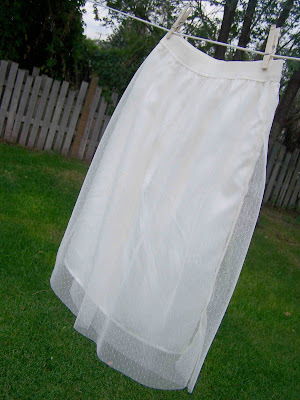 The same process that I used to make the Sheer Summer Skirt. This skirt requires very little materials, and a small chunk of time. 3/4 yd Skirt lining fabric (at least 44 inches wide). Sharp Needles (if working for silk, satin, chiffon, or other light fabrics). Cut your overlay material to 24". 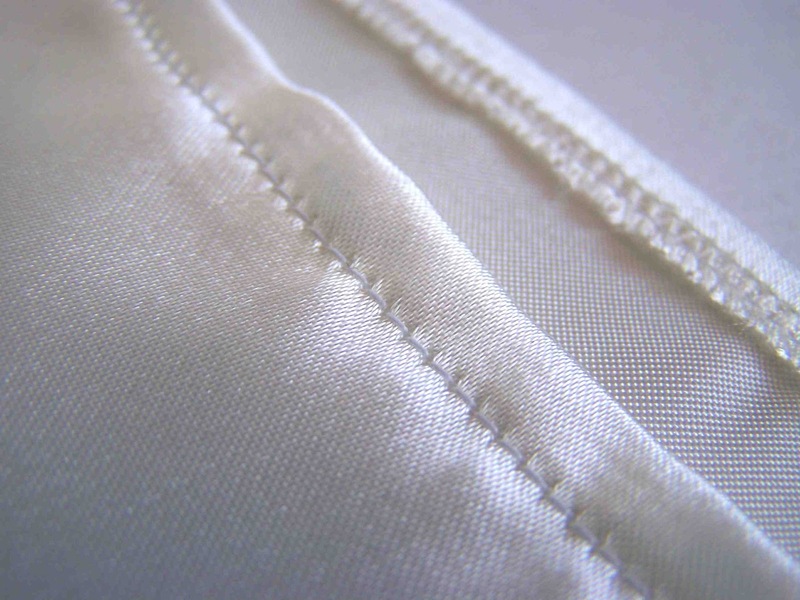 Cut the width in half and remove selvage edges. This will result in two rectangles (mine were 29"x24"). Cut your skirt lining to 23" long. Fold in half, cut down the center, and remove selvage edges. Two rectangles, (22x23"). 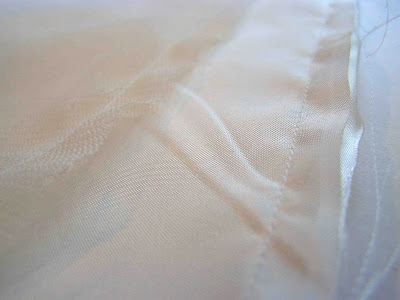 Place the right sides of both your sheer fabric together, sew side seams and finish edges. Repeat with lining fabrics. 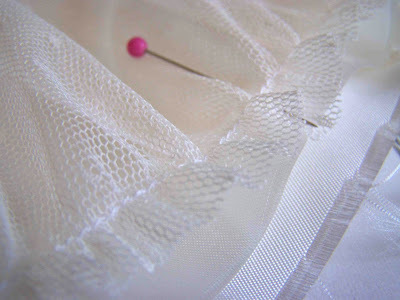 Create a narrow hem for the skirt lining. I serged the raw edges, turned it under 3/8", pressed, and stitched. If you don't have a serger, turn the raw edge under twice to encase the raw edges. 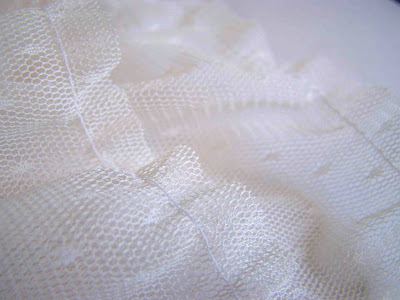 My sheer overlay was a netted lace material that doesn't fray, so I left the bottom edge raw. You could serge or sew a narrow hem if needed. Gather the sheer overlay material along the top edge. Begin gathering row(s) 1/4" from side seams, and about 1/4" from the top edge of the skirt. See my gathering tutorial for more information. **If your materials are the same width, you won't need to gather the overlay. Simply stay stitch the overlay and lining along the upper edge. 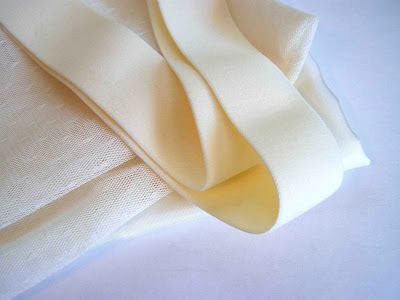 Gather your overlay skirt until it is the same width as your lining fabrics. Position the overlay so that it sits on the outside of the skirt lining. Match upper upper edges of the overlay and lining. 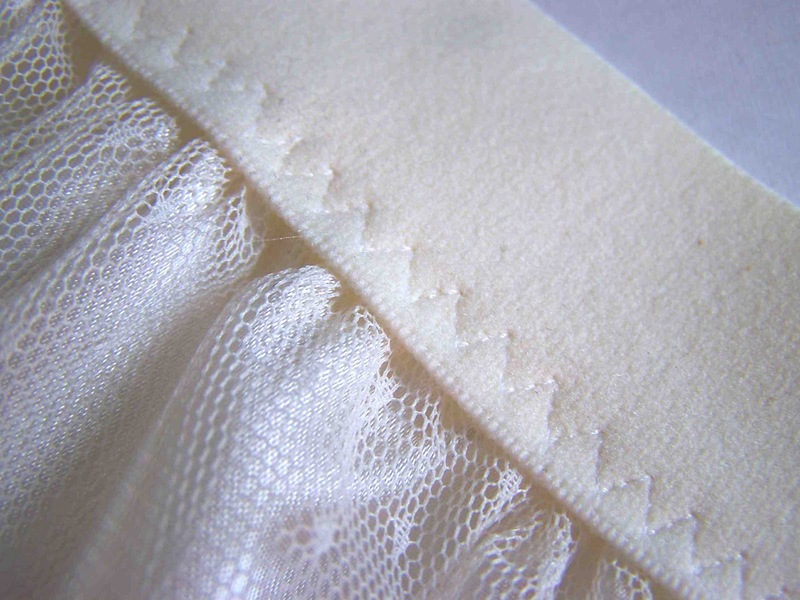 Match side seams. Evenly distribute gathers, and pin along the length of the upper edge. Stay stitch the lining and the overlay together just outside the gathering line. Finish raw edges with an overcast serger or zig zag stitch. 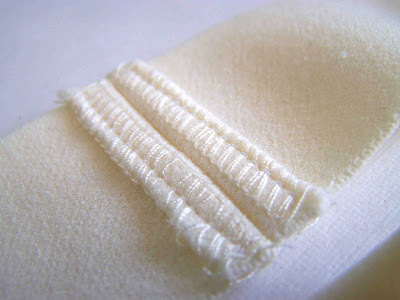 Finish off the edges of your elastic using a serger or overcast zig zag stitch. 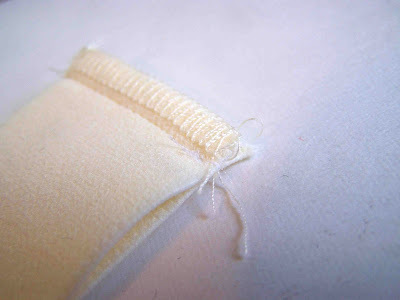 Match up the ends of your elastic, and stitch them together. Open up the seam allowance, and press to either side. Tack down the tail ends so that they lie flat. Divide both the skirt and the elastic waistband into quarters. Match up quarter marks, and pin the elastic waistband to the skirt, overlapping by 1/4" to 3/8". 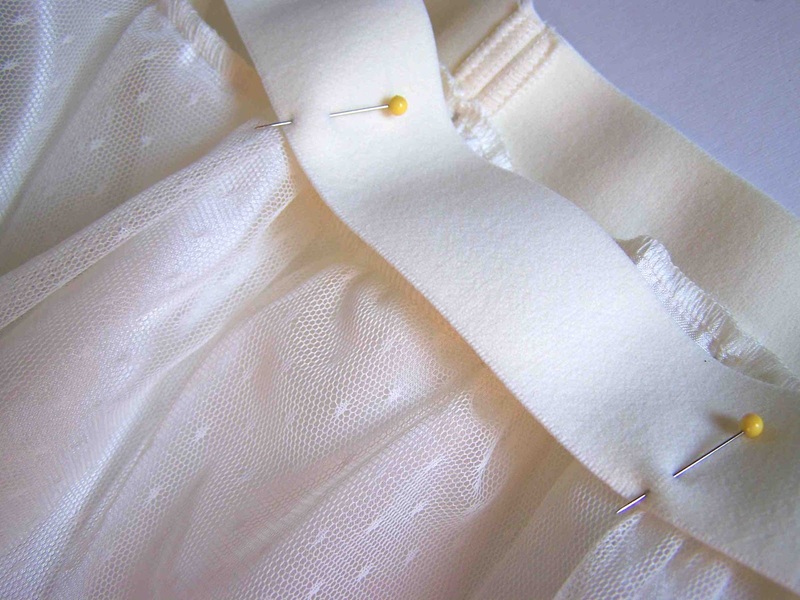 You can further divide the skirt into eighths if you'd like more security when attaching the elastic waistband. 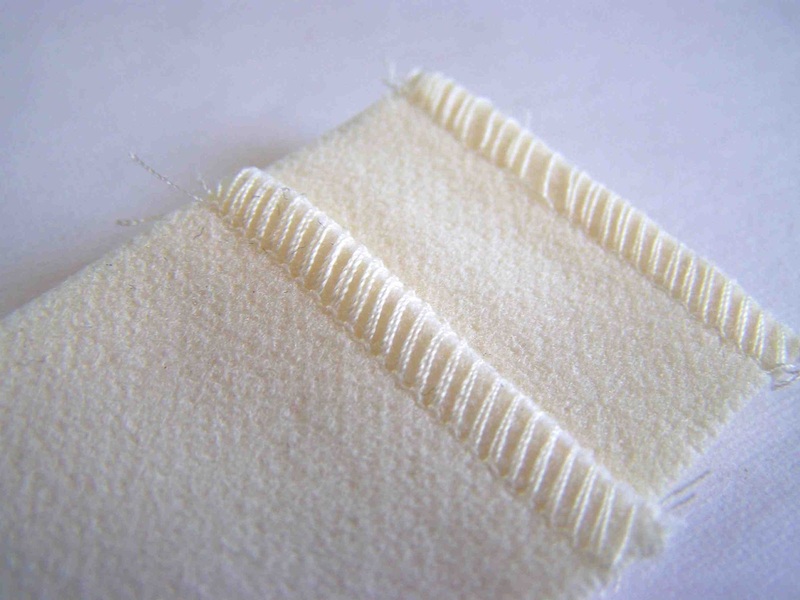 Using a zig zag, narrow zig zag, or three point zig zag stitch, attach the waistband to the skirt. 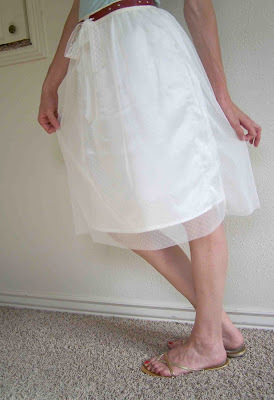 Stretch the elastic to match up with the skirt as you sew. That's it. A basic sheer overlay skirt for summer. It really is very quick to make, and is nice and breezy for the warm weather. 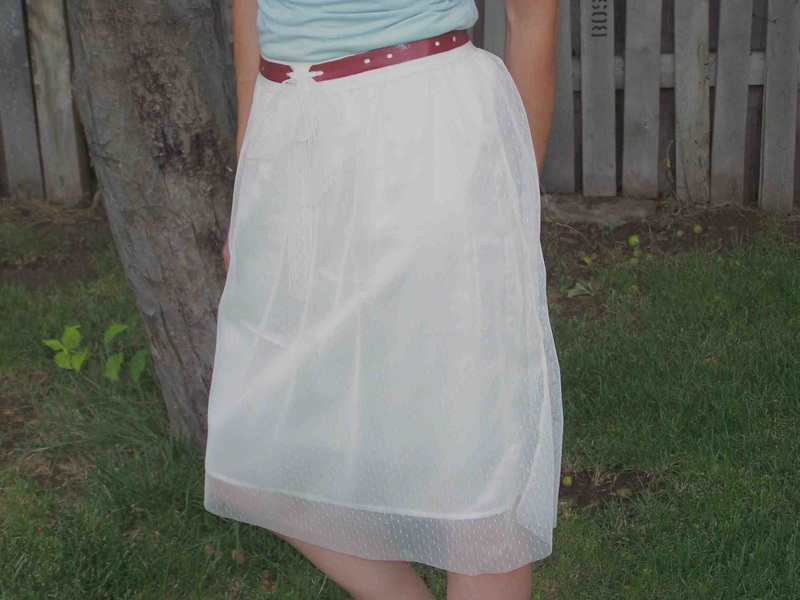 I do love love love this skirt Tricia! I featured it as one of today's top patterns on SewSet. Such an amazing dress that is. thanks for sharing this awesome tutorial.